Eleanor Ann Thompson married Henry Man on 17 May 1777. Eleanor (also known as Eleanora) was born on 13 November and christened on 21 November 1744 at St Mary Aldermary, London. Her father, James Thompson, married her mother Ann Easthem on 30 October 1742 at St Benet Paul’s Wharf, London. In 1777 Richard Denison Cumberland, Henry Man’s first cousin, wrote to his brother George letting him know that his cousin Henry was about to marry a Ms. Thompson and observed that the match was: ‘A good one — because it is as equal as anything of this kind can be, ’tis a toss up which has the best of the Bargain’. Note a description of the Man family arms by Hubert Man includes the following: ‘The arms show that a male ‘Thompson’ married a female ‘Balchen’ [I do not think Hubert was aware as to which male Thompson married which female Balchen]. It is believed that James Thompson was a customs excise officer. Eleanor’s baptismal record is on the IGI Batch P001511 Source Call No. 0845228 Film: 6903682. Eleanor Thompson was a lady of some social ambitions. A note by the Rev Morrice Man states that: We have a sampler worked by her in 1756, which is worth quoting: “O ‘tis a lovely thing for youth to walk between in Wisdom’s way, to fear a lye, to speak the truth that we may trust to all they say. But Lyars we can never trust though they should speak the thing that is true, and he that does one fault at first and Lyes to hide it makes two. Have we not known nor heard nor read how god abhors deceit and wrong. How Ananias was struck dead catched with a Lye upon his tongue. So did his wife Sapphira die when she came in and grew so bold as to confirm that wicked Lye that just before her husband told. The Lord delights in them that speak the words of truth but every Lyer must have his partner in the Lake that burns with Brimstone or with Fire. Then let me always watch my lips lest I be struck to death and hell since God a Bark of reckoning keeps for every Lye that children tell.” April 13th Eleanor Thompson 1756. 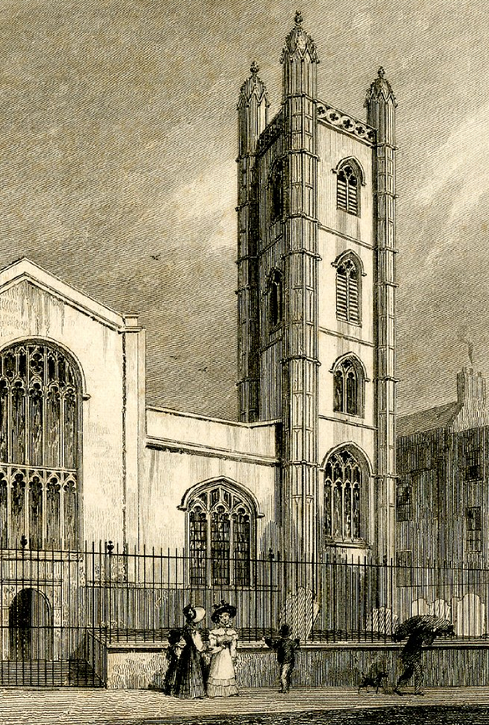 James and Ann (Easthem) Thompson had a son James Freeman Thompson who was born on 26 December 1744 and christened on 2 January 1745 at St. Mary Aldermary. James died in March 1757 aged 12 years and was buried on the 27th of that month at St. Gabriel, Fenchurch.